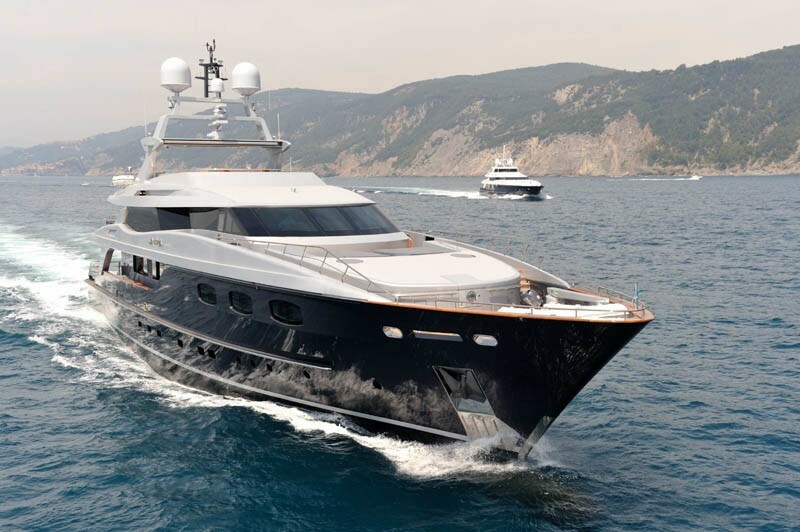 Motor yacht IRA is a 43,00m (141’) motor yacht built in 2009 by Baglietto, one of Italy’s leading superyacht builders. 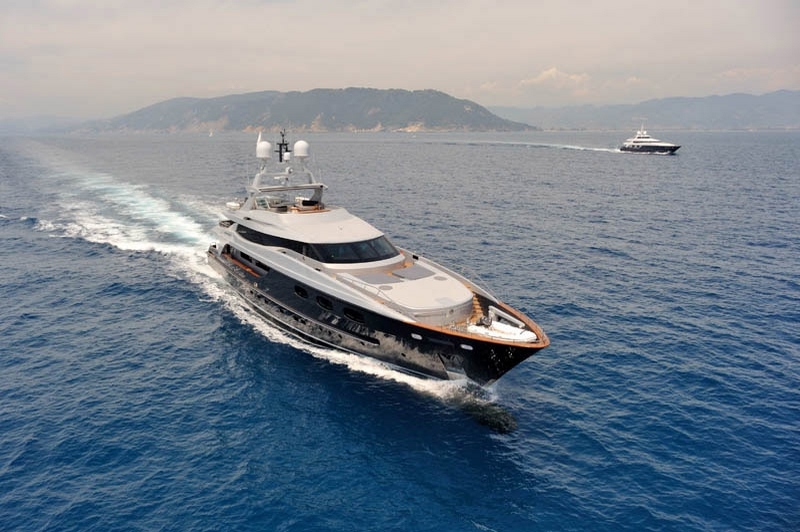 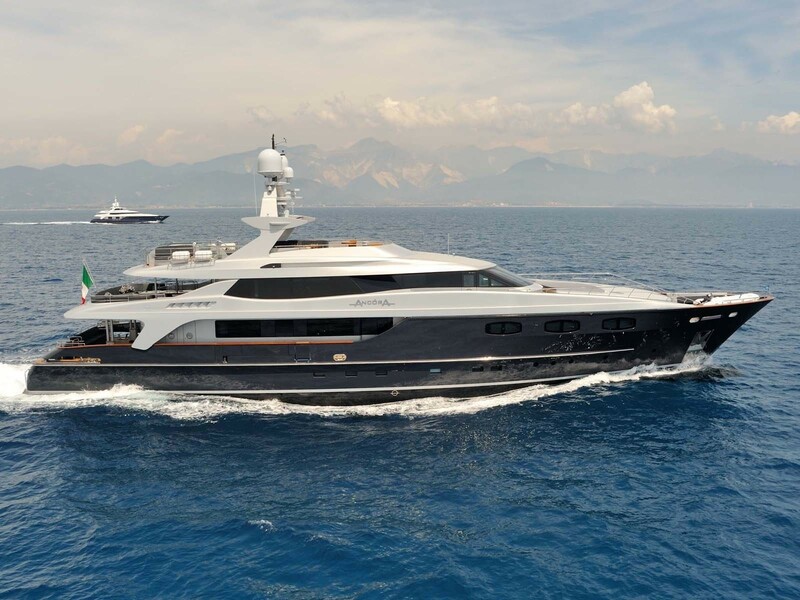 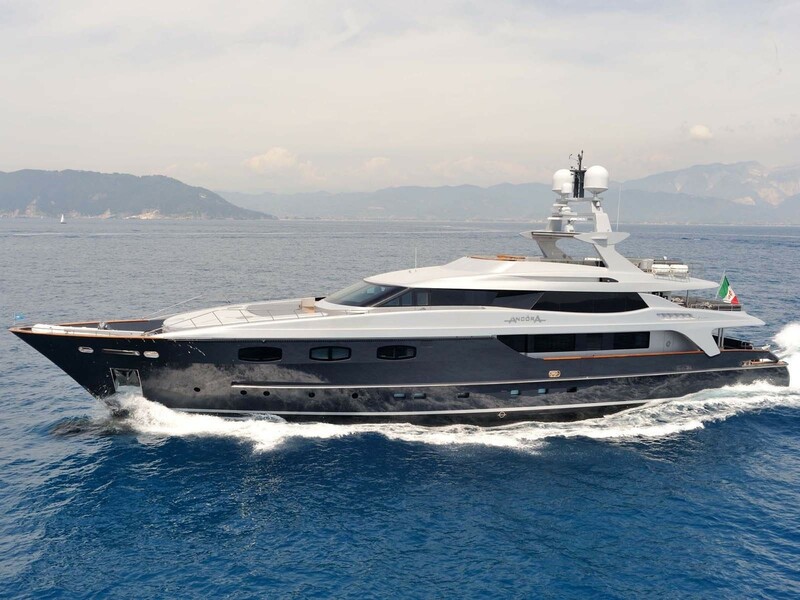 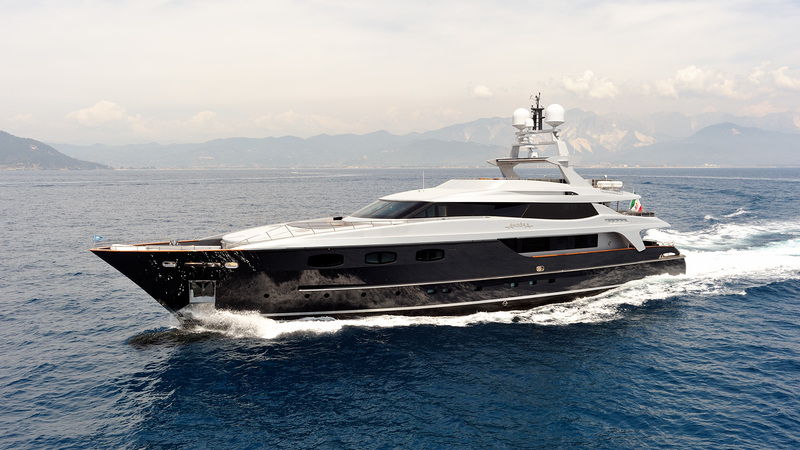 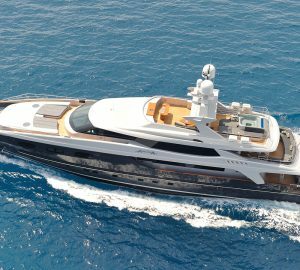 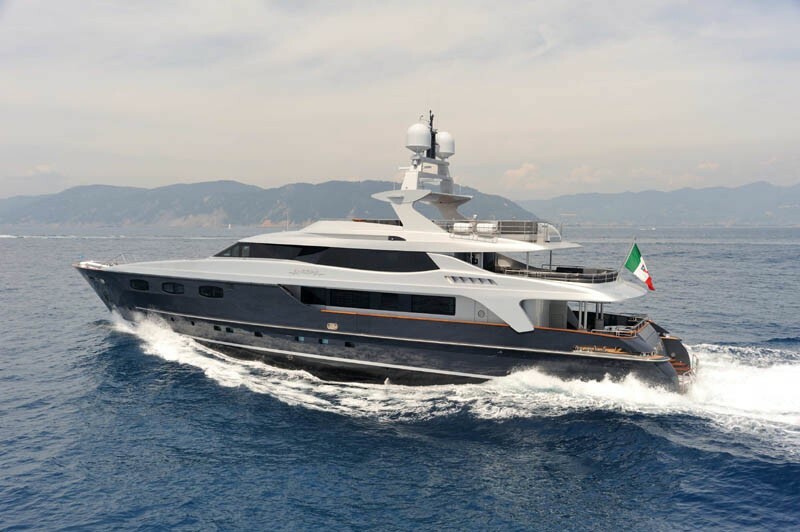 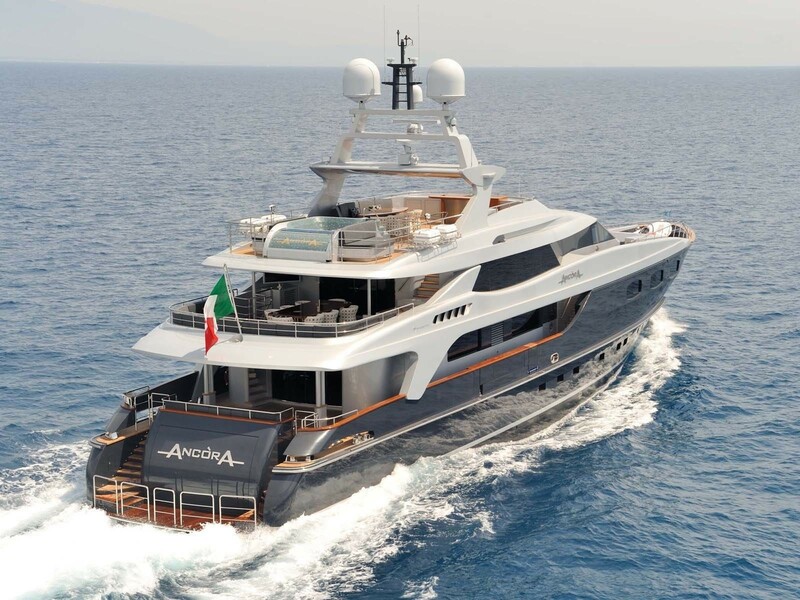 Luxury motor yacht IRA’s external lines are slender and aggressive, in tradition with Baglietto’s displacement yachts designed by the Italian Designer Francesco Paszkowski. 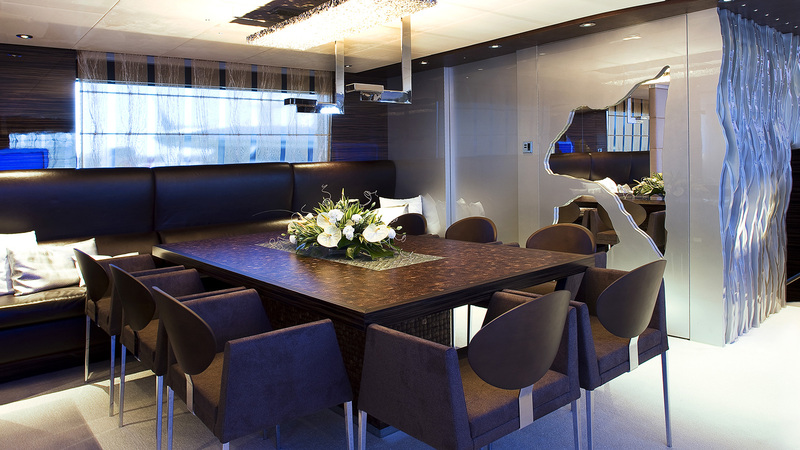 Megayacht IRA’s interior design is by the design firm Art-Line and integrates a déco design reinterpreted with clear modern elements. 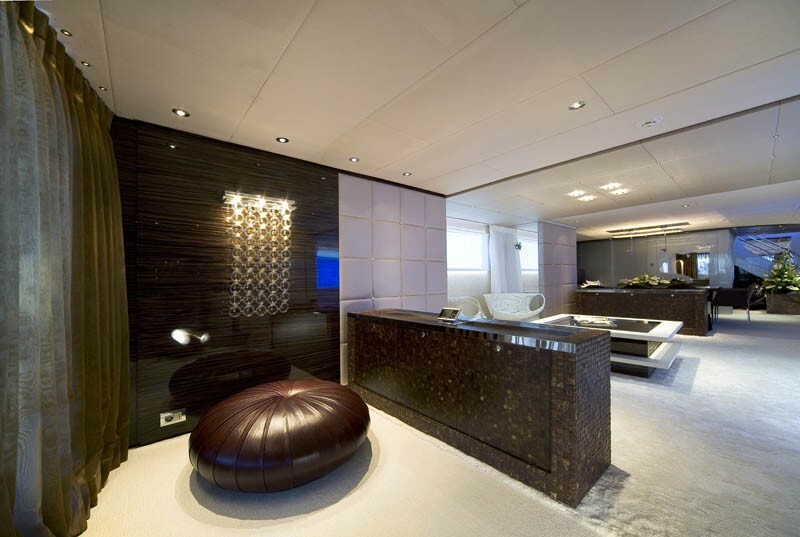 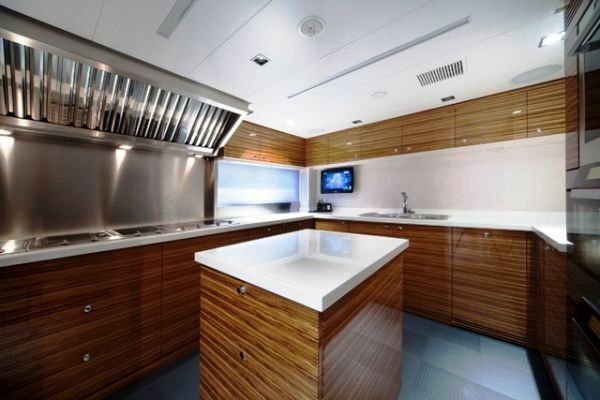 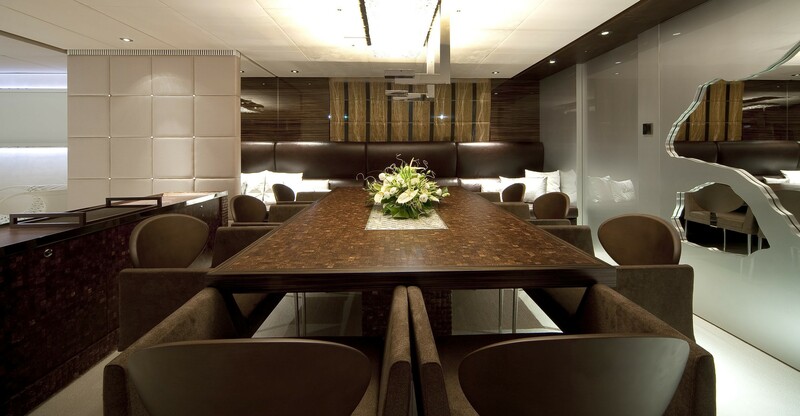 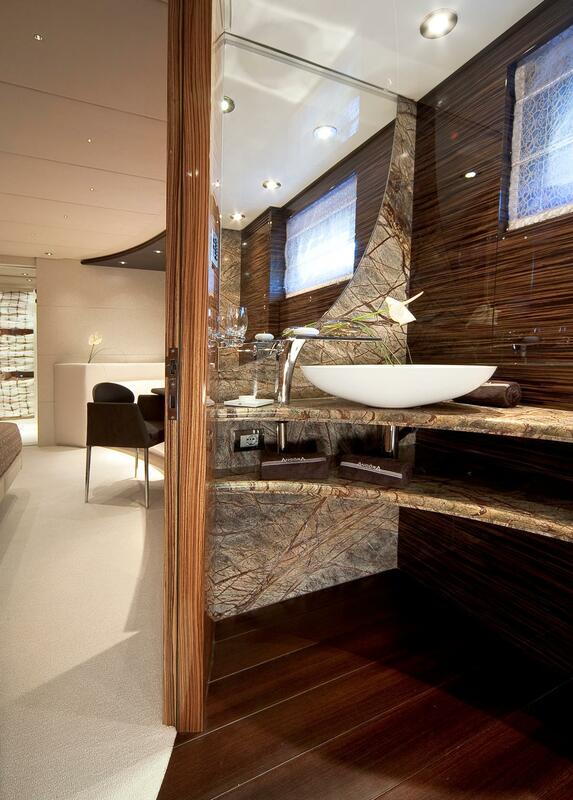 The yacht has an interior characterized by elegant Zebrano wood with a polished finish, mixed with Forest Brown marble and plaited leather on the covering panels making the environment very welcoming and comfortable yet formal at the same time. 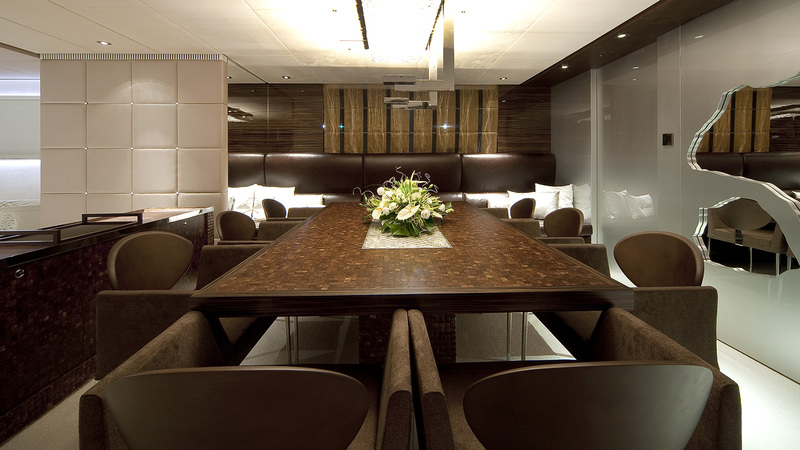 The furniture is crafted in Zebrano and polished lacquered wood, and wide areas are covered with decorated leather. 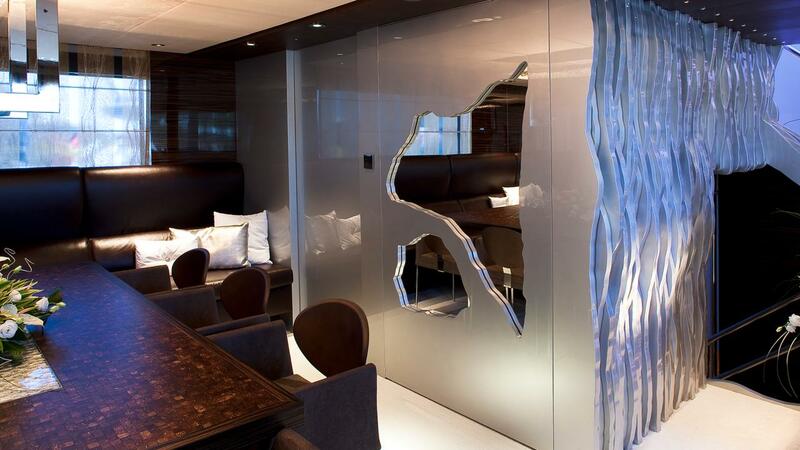 The Baglietto motor yacht IRA boasts large windows in the main salon that give the interior a remarkable airiness. 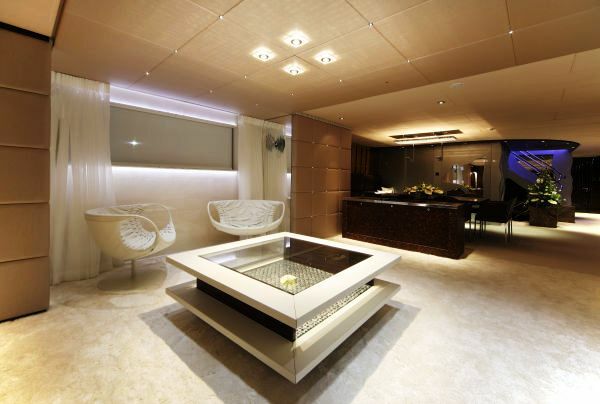 The sophisticated indoor artificial lighting including a mix of low consumption led lights built in the ceiling; incandescent lights and fibre optics create a special atmosphere at night. 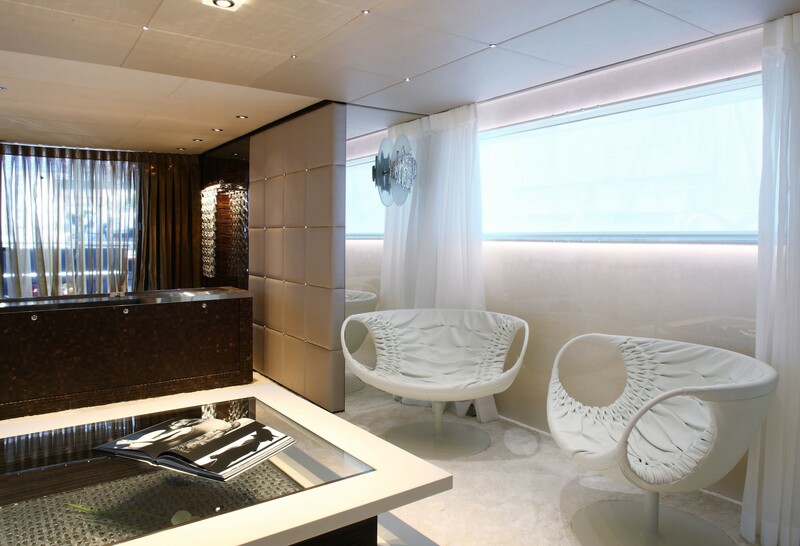 During the yachts design process, particular attention was paid to the layout and use of volumes. 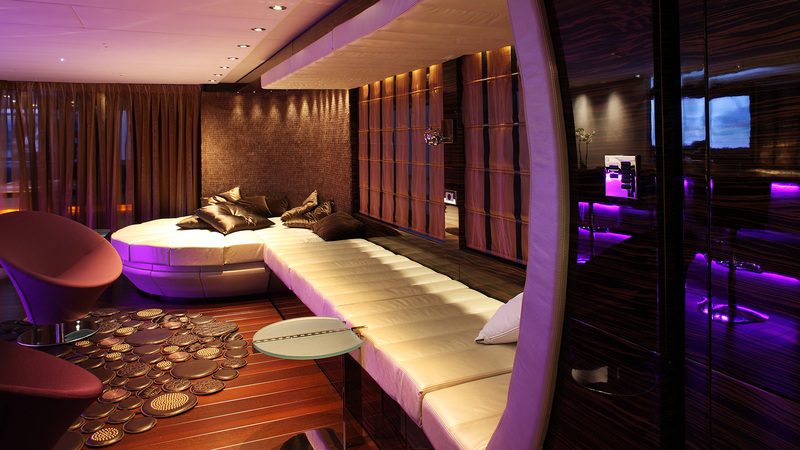 The wide salon divided into two parts including a social lounging area, which surprisingly features no sofa's, but four large lounge chairs instead, and a dining room. 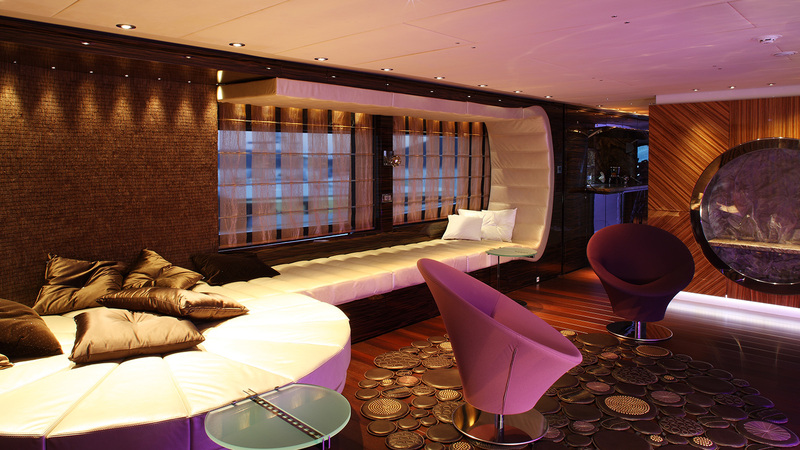 Forward of the salon and to port is the well equipped galley while on the starboard side there is an owner’s area which includes a relaxation area with a curved sofa spanning the starboard wall leading to a luxurious cabin provided with an en-suite bathroom including a custom-made luxury bathtub, whose curved shapes and lines are repeated all over the vessel. 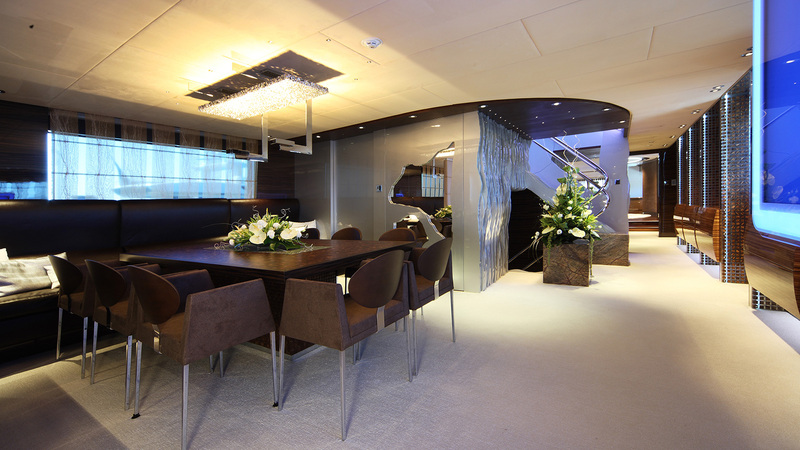 Her three decks are linked internally by a grand staircase which is one of the defining elements of the interior layout and design of the yacht. 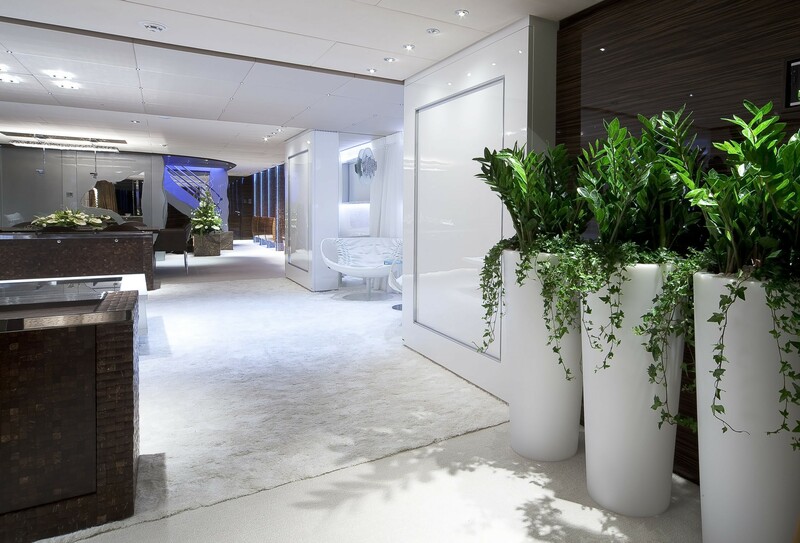 It is down these stairs that the remaining cabins are located and include two spacious VIP cabins just forward of the engine room, and two twin cabins forward of the lower deck lobby. 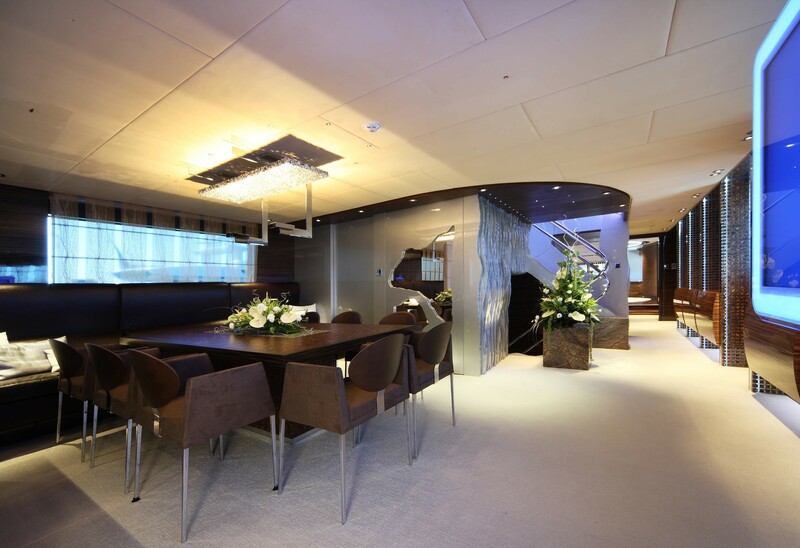 The upper deck features a large modern sky lounge that features a lounge/bar and a TV area. 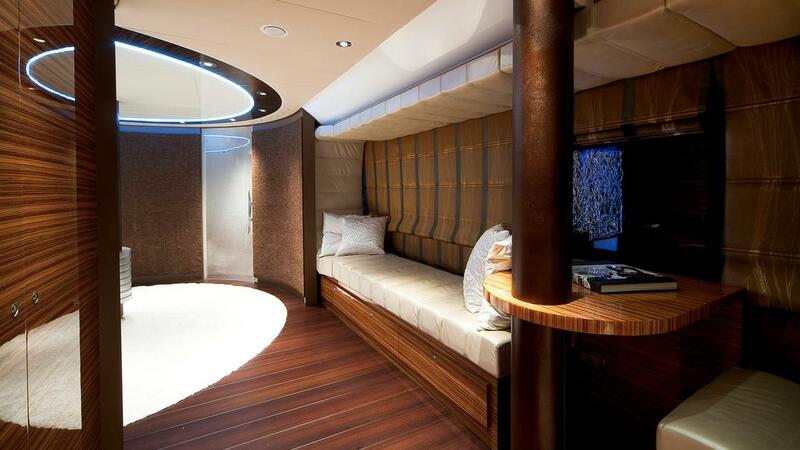 A portside corridor leads to the wheelhouse and a comfortable Captain’s cabin. 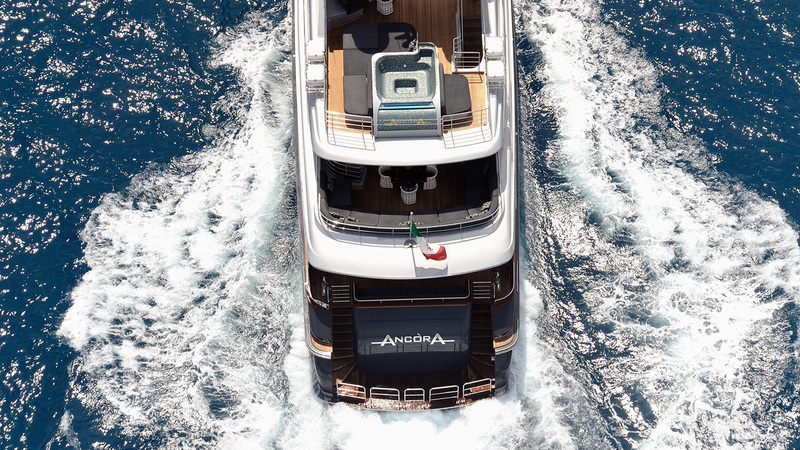 IRA’s upper aft deck contains a covered casual dining area that seats 8, and the aft section of the deck boasts a large U-shaped sofa. 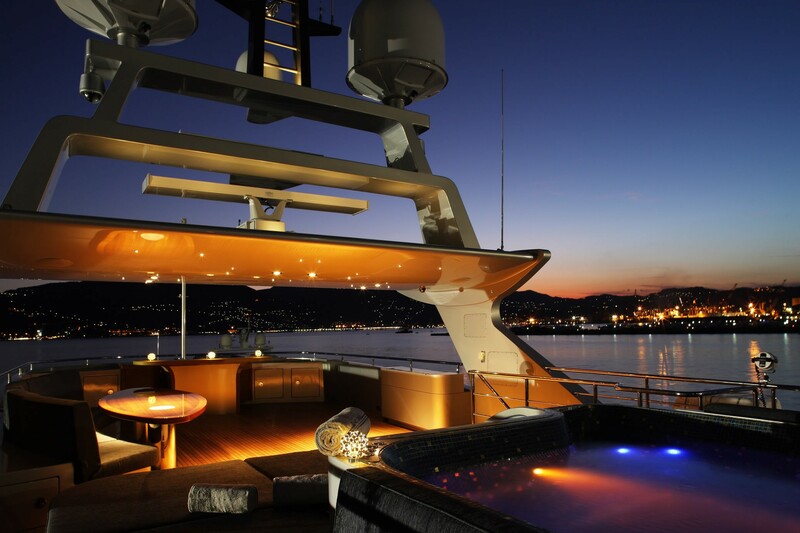 Stairs on the starboard side lead to the delightful sundeck. 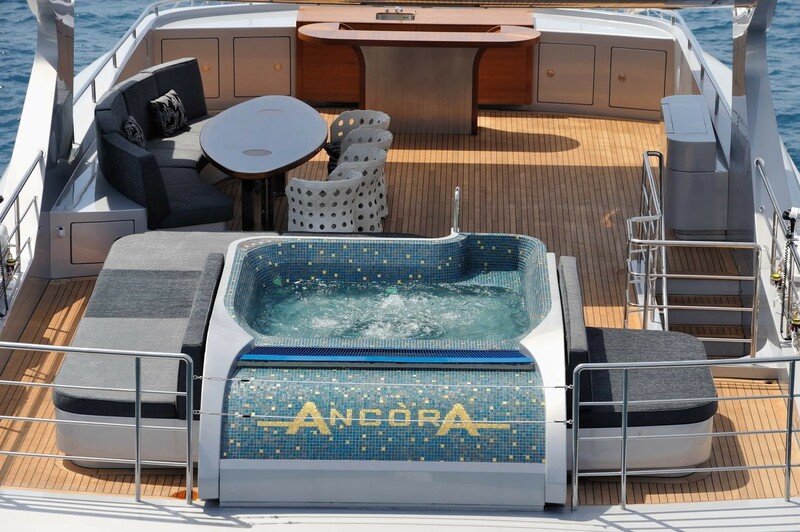 The aft part of the sundeck is equipped with a remarkable custom pool, lined with mosaic tiles, surrounded by luxurious cushions and sun pads. 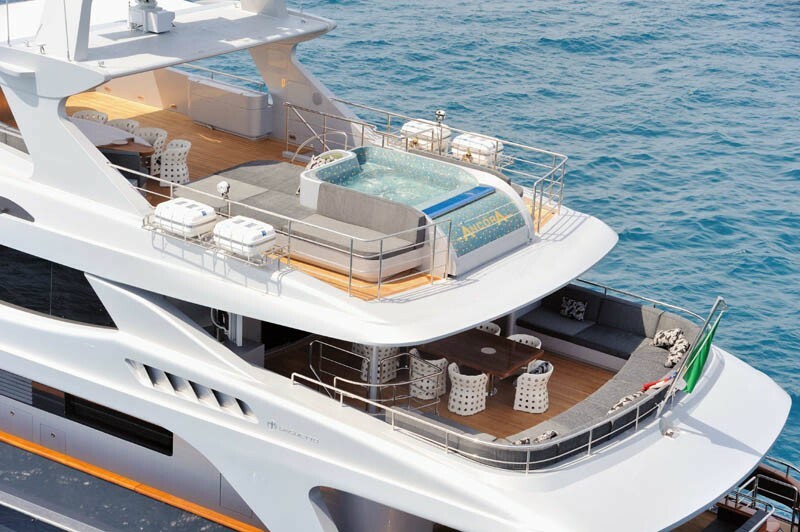 The forward portion features lounge chairs for taking the sun, a dining table, and a bar overlooking the bow of the yacht. 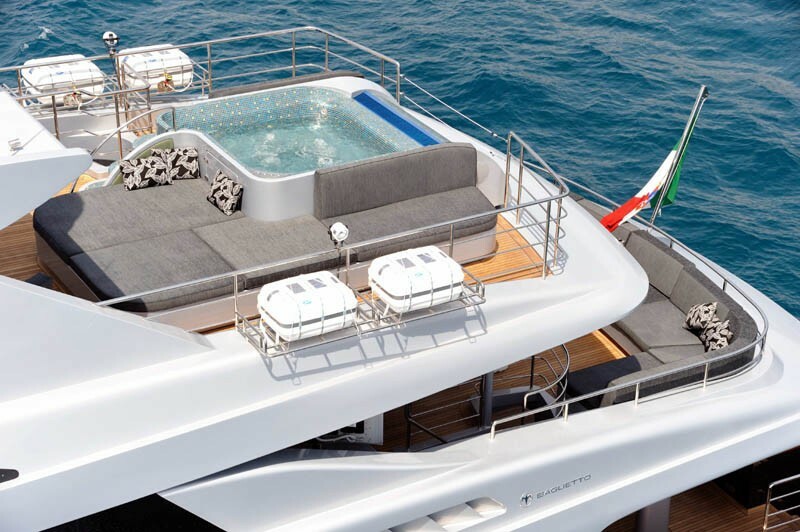 Superyacht IRA’s main aft deck is styled with a large comfortable sofa and has stairs leading to the large bathing platform where you can enjoy some of the yachts numerous water sports toys. 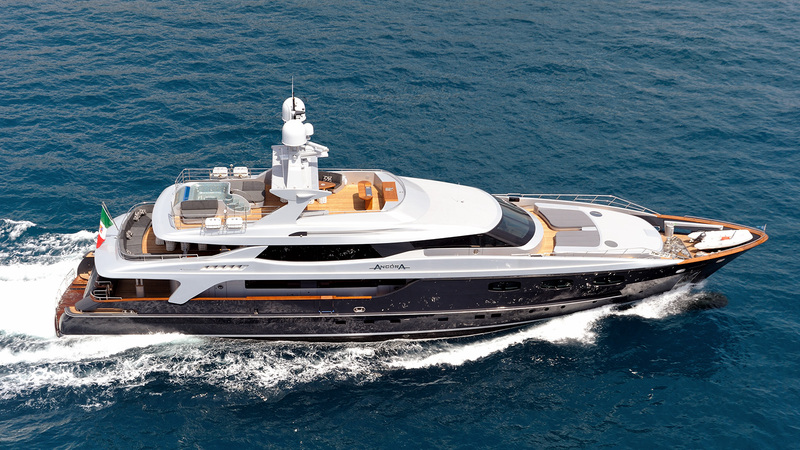 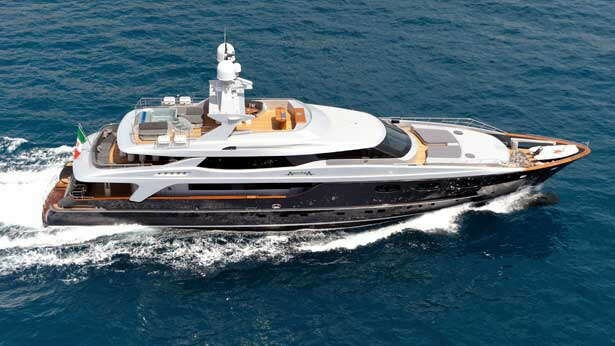 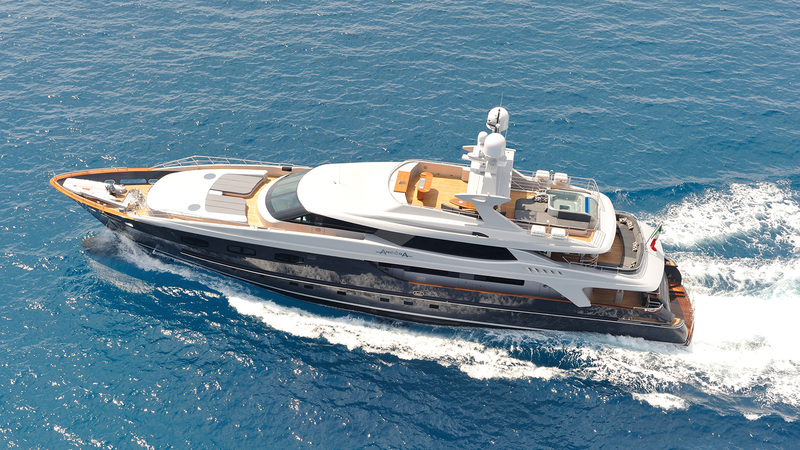 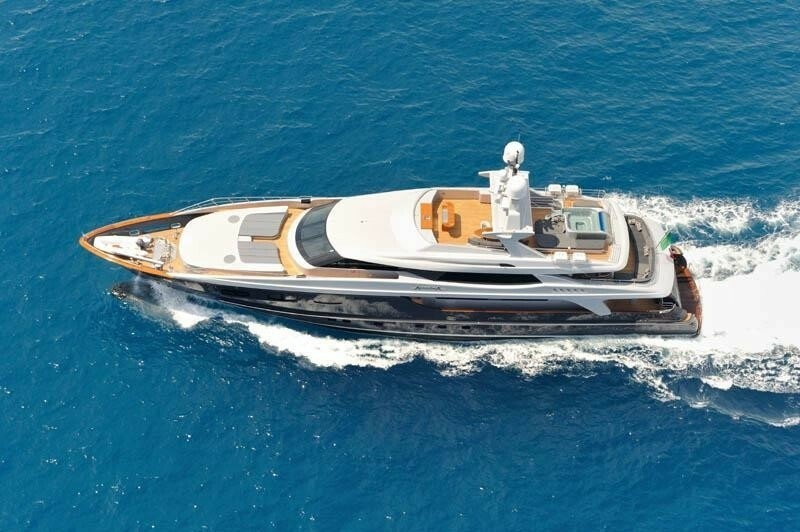 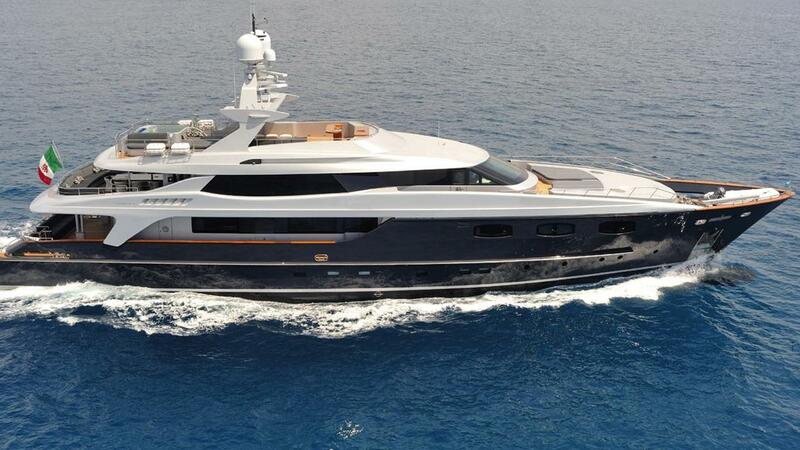 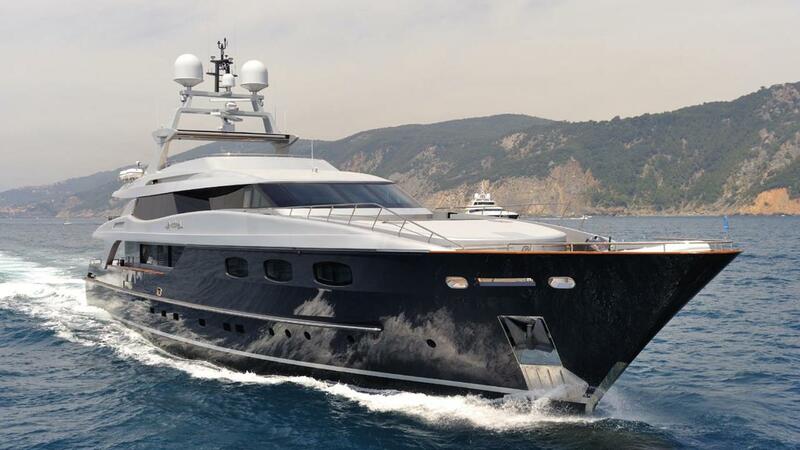 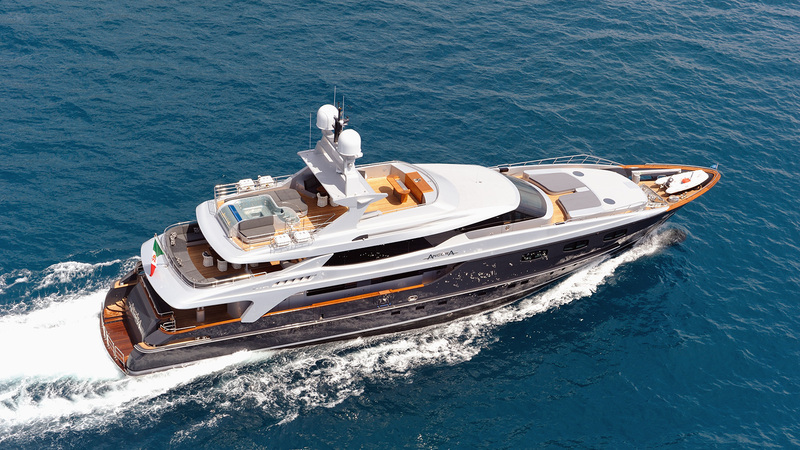 Luxury motor yacht IRA is a floating masterpiece of both modern and classic design. 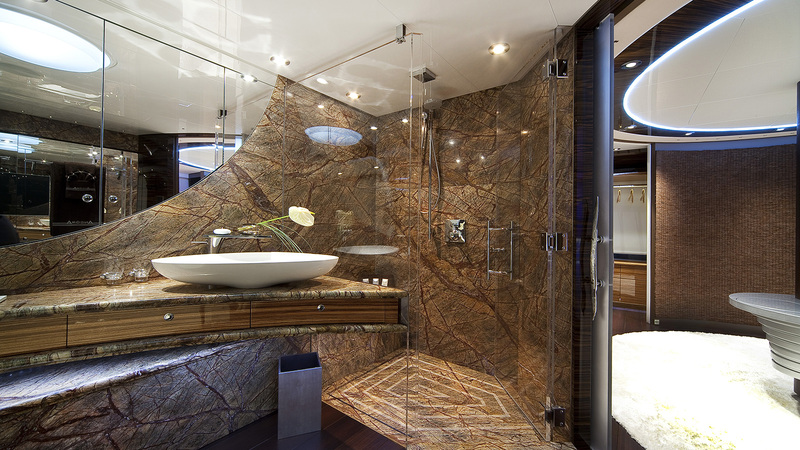 Finished with luxurious elements such as pure gold, silver and crystal mixed with leather, exclusive African woods and forest brown marble. 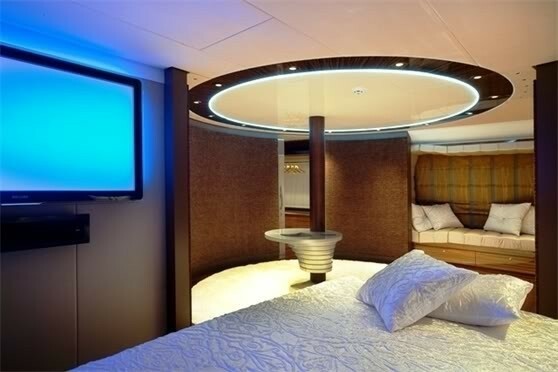 12 Guests will enjoy chartering in exceptional style and up most comfort. 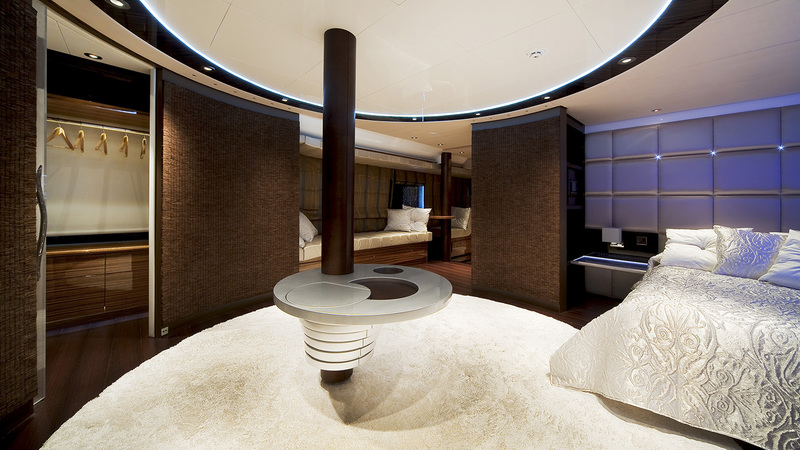 The master cabin located on the deck level with impressive and unique, circular design. 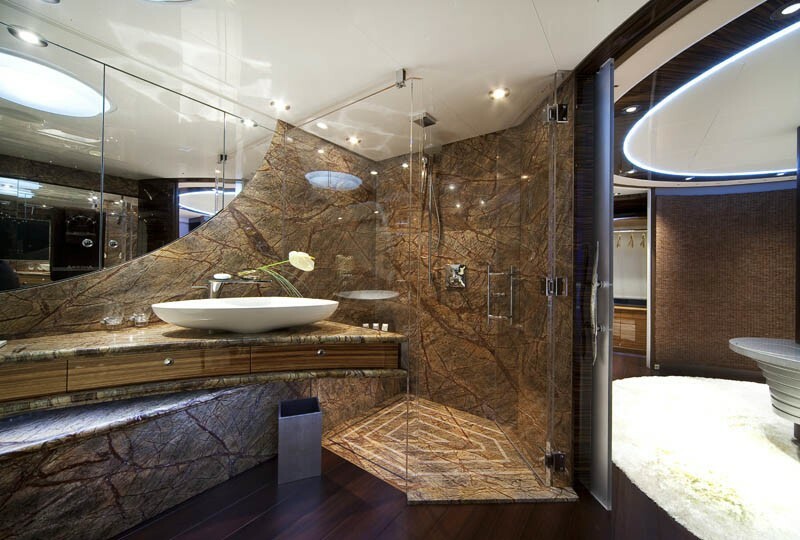 The suite includes an impressive private lobby, custom made bath tub, 100% silk carpets throughout, state of the art audio visual system including LCD and surround sound system in bathtub. 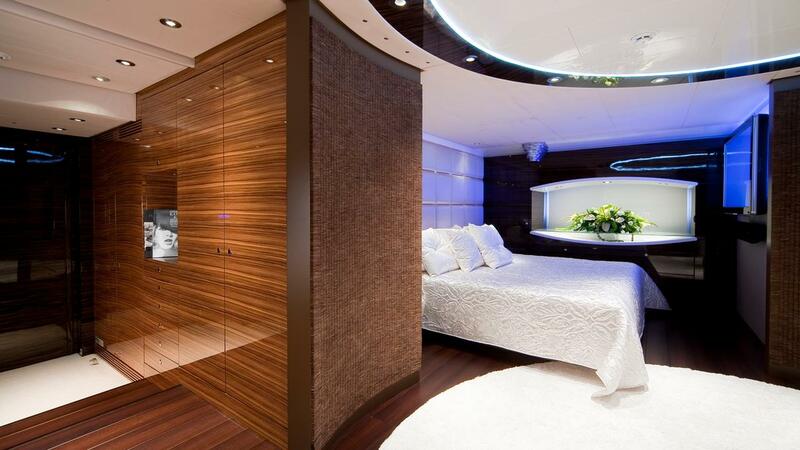 Large, well lit walk-in wardrobe. 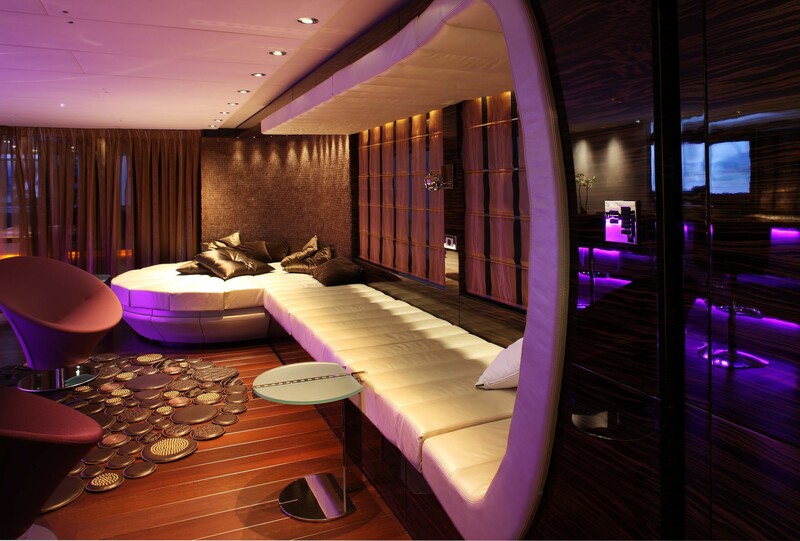 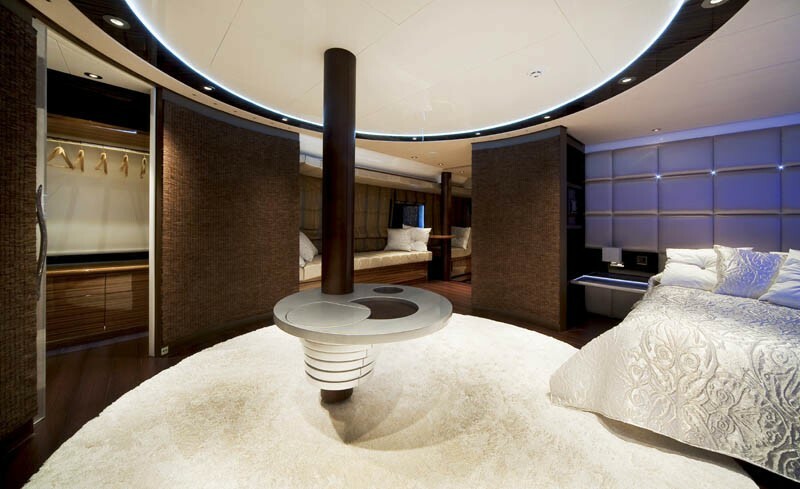 There are 2 uniquely designed VIP Cabins with double beds, a functional private lounging area, walk-in closet, shower room with impressive marble features. 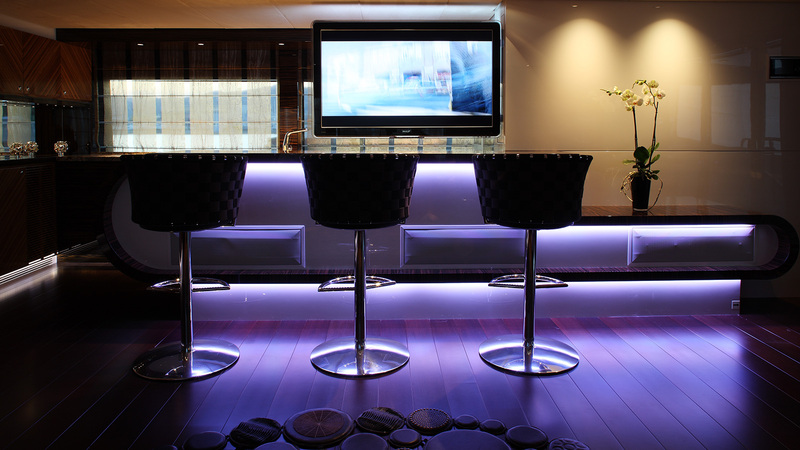 State of the art audio visual systems. 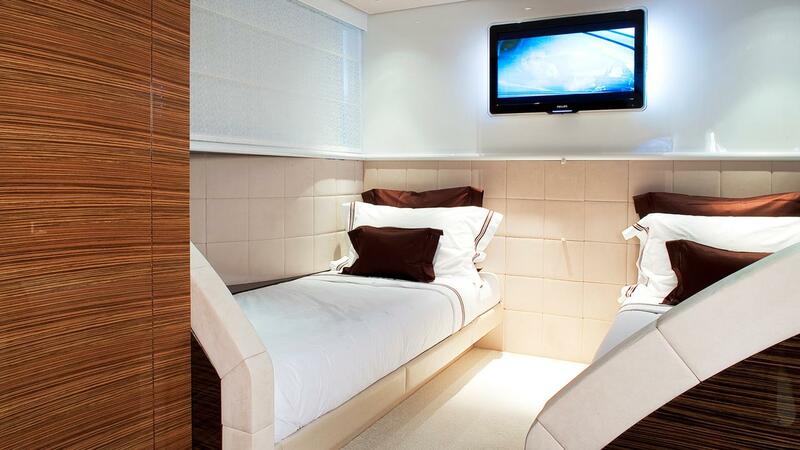 There are 2 further twin guest Cabins with a spacious design and optional pullmans. 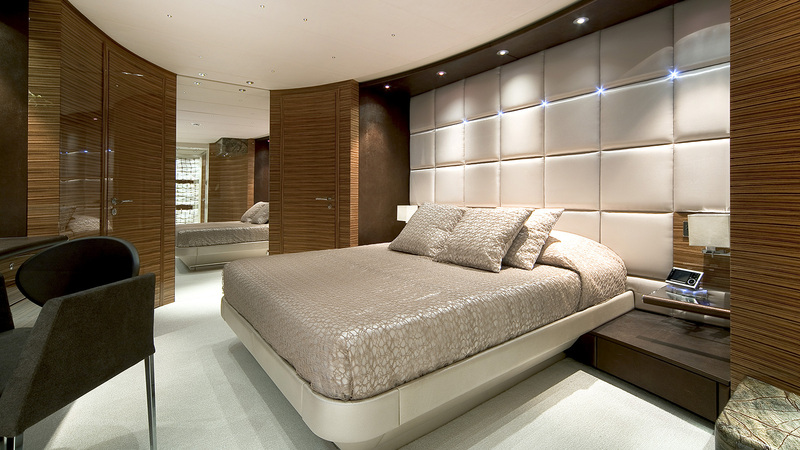 Large closets, good sized shower and WC rooms, state of the art audio visual systems. 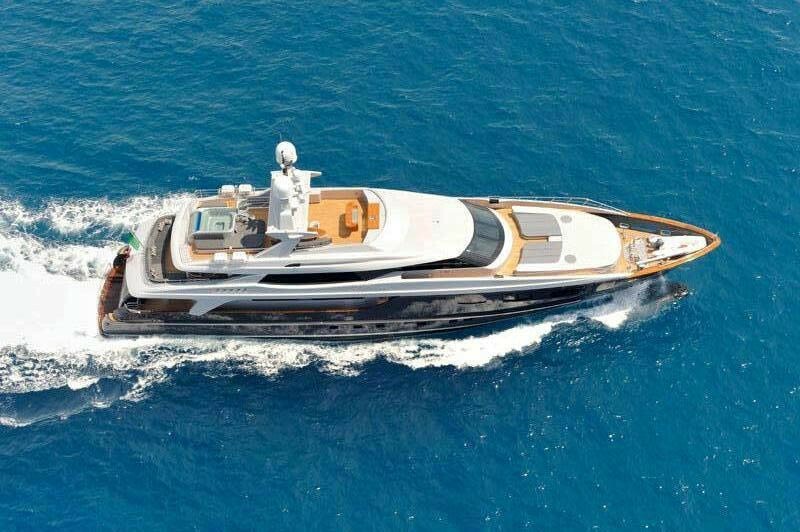 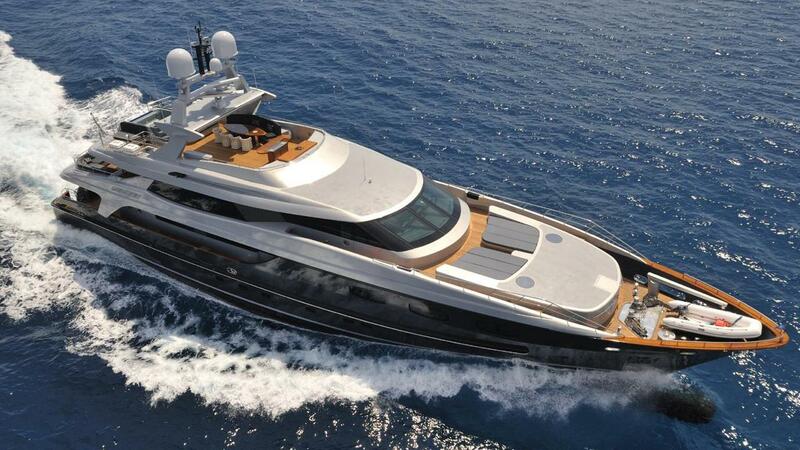 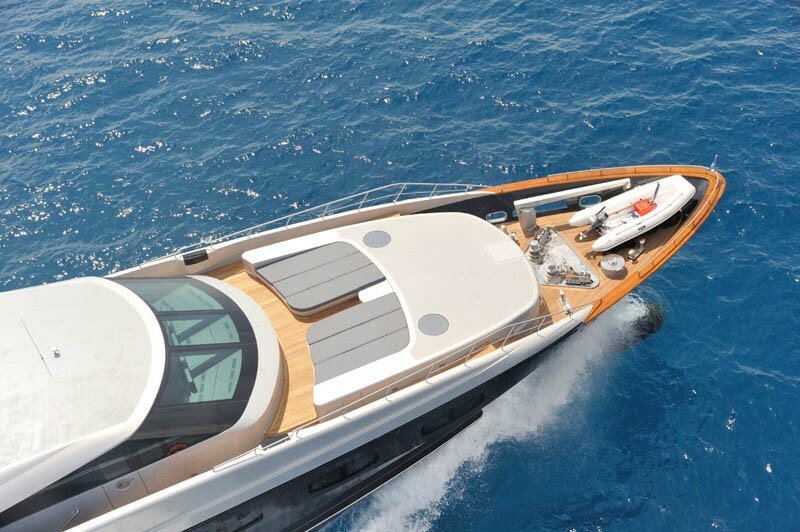 Super yacht IRA has the following extras onboard: Her Tenders & Toys include Nuvo Ragna Jet ski. 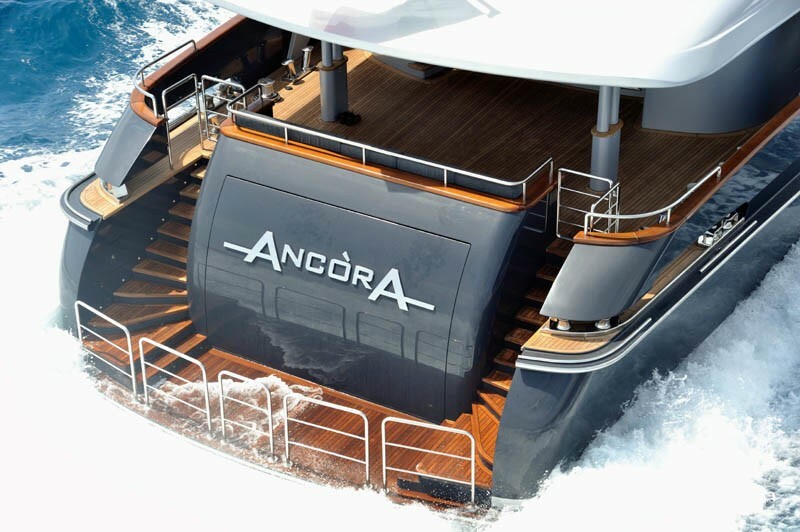 Communications include Full SAT Communication system to support voice and data any where in the world. 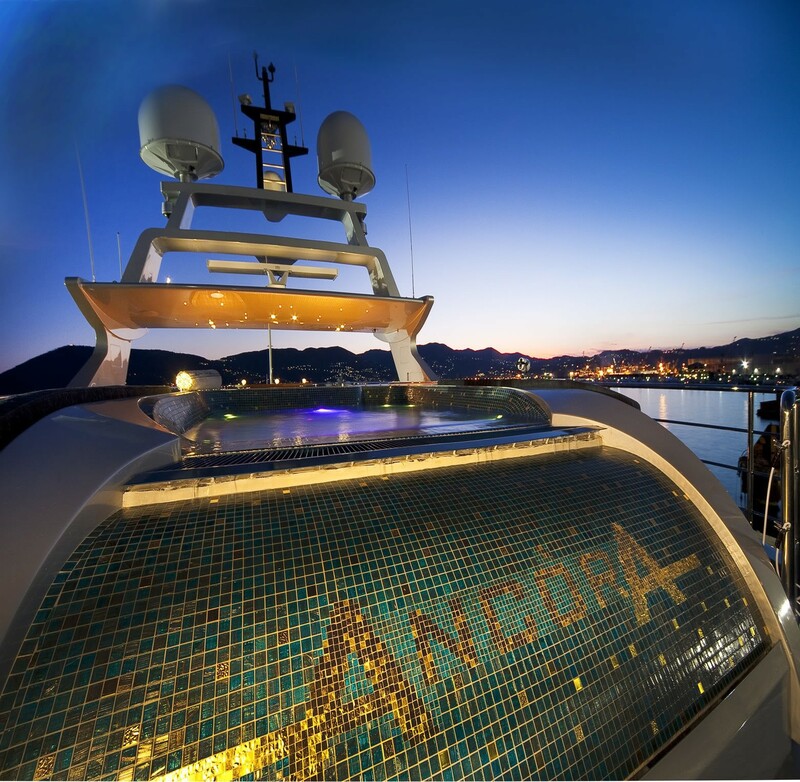 Regional mobile phone services for Northern Italy and French Riviera. 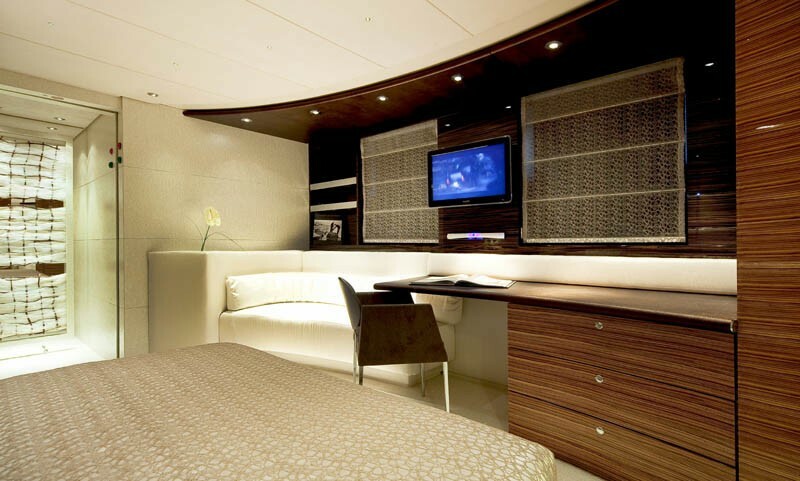 Audio Visual Equipment and Deck Facilities include state of the art audio visual systems, 18 LCD flat screen TVs(including but not only, 2 in saloon, 1 in the upper deck lounge and upper cockpit and 1 on sundeck), kalidescape, satellite TV decoders, broadband communication. 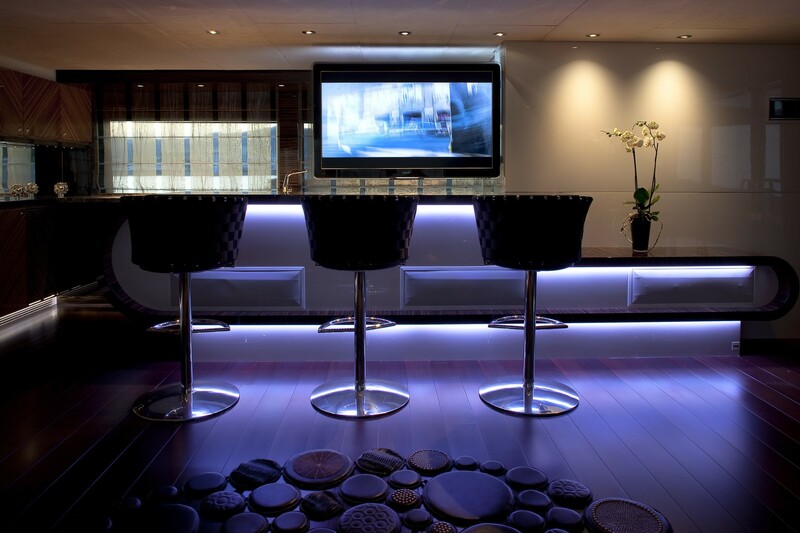 Top quality speaker systems throughout.